Kate Middleton is living the dream every little girl holds dear…and every woman remembers with a smile…becoming a Princess. For the first time in over 350 years, a non-royal like one of us is beginning that journey for real. Not having the time or patience to verify, I have to trust that the historical observation is accurate…but really? No commoners in 350 years? 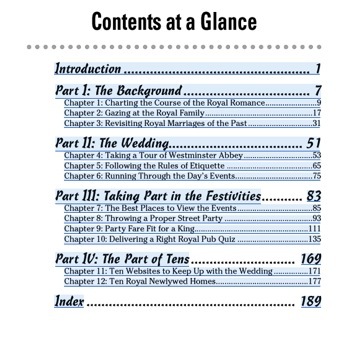 That must take us back to Henry VIII’s wives. And isn’t the Franklin Mint an American company? So has it adopted the British monarchy or has someone researched global monarchy and concluded that it’s been commoner-free for 350 years? Commoners – time is running out. 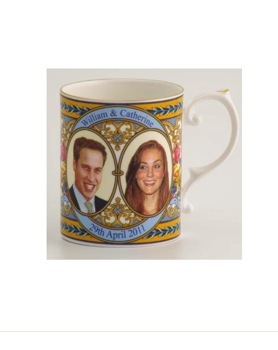 You need to decide what merch will you be rush shipping for your Royal Wedding festivities. 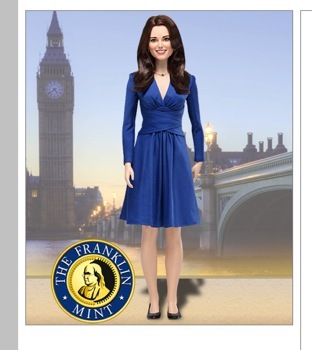 Will it be Franklin Mint’s Kate Middleton Royal Engagement Vinyl Portrait Doll? 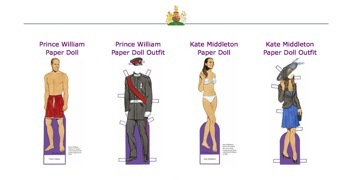 Or these charmingly low tech paper dolls? Which turn out to be rather saucy. Of course, no party would be complete without a ring. 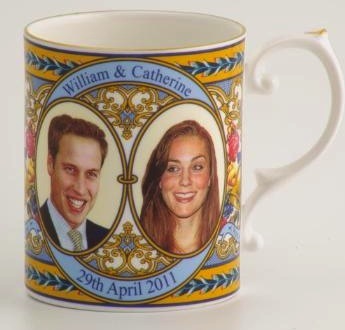 And no royal memorabilia collection can live without a mug. 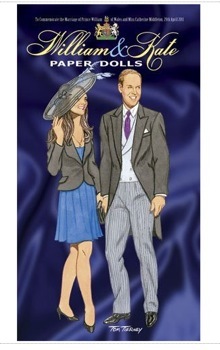 What else has tickled your royal fancy? She’s hot… he’s not… BALDING! the younger brother should sweep in and steal the scene. Kill dad! poison the heir! Steal the throne like that little privlidged punk u are! god,,,, the poor guy… all that attention…. do you think someday he’ll just go super short? all rockstar like? aren’t sting and bono bald too? i think he should do it now. confront the tragedy and seize the media moment! The paper doll company knew they could picture her in her ladylike underthings, because that is how William first noticed her: in a lingerie show at college. True story! Behold the future queen. And yes, if Wm. weren’t the future king, he would be way out of his league. I’ve got a little soy-sauce-sized dish, great for used tea bags, from Charles and Diana’s wedding that someone gave me, and I’m quite partial to it . . . what a bizarre tradition, making commemorative dishes. I also have the memory of my passage to Heathrow, on the day I was moving back to the US after living in London for a year, being mightily impeded because of the fact that it was the day of Sarah and Andrew’s wedding. The British royalmania has always really bemused me (and enraged all of my British friends). Kate really takes the prize, though, for completing the commoner’s fairytale (and thank heavens it wasn’t that dreadful divorcee Wallis Simpson, a bloody American no less, who took the honor! Such frightfully poor taste!) 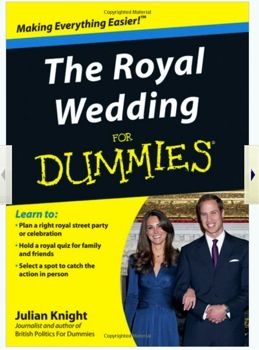 The Royal Wedding for Dummies: isn’t that redundant? I keep hearing how plain he is – but I think Will has that offbeat smartish British hotness – like young James Fox or Julian Sands. And he does look more Di than Charles. And she’s been after him for 8 yrs. Maybe he is lovely and nice and they will live happy ever after and we are all just cynical Yankees. Not that I am buying a t-shirt, but just sayin’ . . .